The Cuisinart DK-17 is a cordless electric kettle made of classic stainless steel. It comes with a stay cool handle and has a capacity of 1.7 litre. This cordless kettle provides fresh-tasting instant hot drinks anywhere, anytime through easy, one touch operation and concealed heating. 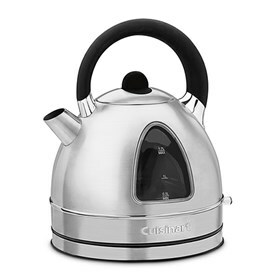 The Cordless Electric Kettle has many exciting features for users of all types. You can extend the lifetime of your Cordless Electric Kettle with the purchase of a FactoryOutletStore Factory Protection Plan. The Cordless Electric Kettle is sold as a Brand New Unopened Item.